I have read several books on running and been unimpressed. Sillitoe, ‘the long distance runner’, concentrates on escape. Haruki Murakami runs and runs well – he interviews far better on the subject than his writing on the subject, where, in my opinion, he is completely engrossed with the feelings of being ‘in the zone’; perhaps that is what he feels his readers can relate to. Piers Anthony describes more what I want to read about, the incidental daily grind, the curious fixation with seconds gained or lost and the feeling of well-being that makes you go again – the junkies’ fix, but of endorphins. He refers to running in his postscripts to books, where he generally tells what was happening in his life that translated into topics within the story he has told. Easily the best, in the sense of being engrossing, is Christopher McDougall‘s Born to Run which describes elite athletes of a particular sort and tries to explain how it is that man—as an animal—has this passion for running. Two things stood out for me in his book: one is the description of the pattern of hunting that uses what man is good at – the ability to run all day means that if he is persistent he can run down absolutely any animal if he doesn’t let it rest. The second is his description of man’s continued ability to run with increasing age. If I understood correctly, he wrote that if you look at changing performance with age [improving to a peak around thirty and then a steady decay] by inspecting a large volume of data for long races such as marathons, then the equivalent performance of an eighteen year old is found to be matched by the amazing age of sixty-two. I think he has confused two populations; each is made up of those who are running at the given age, but they are not the same people, they are the ones who happen to be running at that age. 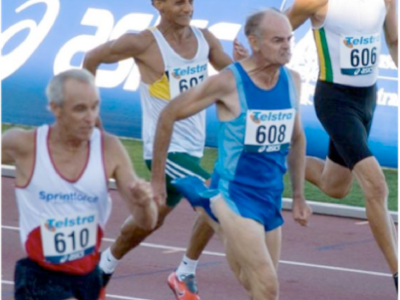 In particular, far fewer people are still running in their sixties and the ones that do are exceptional (in some sense) whereas the eighteen year old group will include many more who are discovering if they can finish, not how well they can run. What I’d like to compare is the times of the sixty-year olds with their own times at eighteen. Even that would be a biased population, being those who have managed to avoid injury for sufficient years that they are still able to run. One might even claim that in so doing they had not been trying hard enough. I found Brendan Foster’s autobiography fascinating. Even thirty years after reading it I am still taken with his description of discovering a lack of vitamins and, in curing that, jumping from being very ordinary to spectacularly successful. Earl Fee, 1922, is a phenomenon both at running and at writing. He has a collection of world age-best records at middle-distance, from age 60 onwards. He had 30 years away from running. Do read both his books, The Complete Guide to Running and 100 Years Young. On his 80th birthday he did 1:11.23 for an indoor 400m, an improvement of 8 seconds on the previous record. On the same day he just missed the record of 31.86 in doing 32.07 for the 200m. in the next ‘phew’ weeks he set new records at 400m outdoors, 1:10.64 and 800m in 2:48.953; in September 2011 he took 17 seconds off the previous best⁴, though for me the 2:14 at 66 is more impressive. I’m 25 seconds slower than my age record, which is consistently poor, as I was that far behind at 35 too. At 10km Haile Gabrselassie did 26:51 at 35 (wow), Michael Hager (UK) did 33:57 at 60.⁵ I’ve done 36 minutes several times in the last few years, including the last six months, which puts me at 92% of the world record, not the expected (by which I mean from the age-grading tables) 82%. Unlike these greats, I can’t do it except when all the necessaries coincide⁶, which I still feel happens more by chance than by intent. My latest idea is to push the weight down so that the weight after the race is 66kg, not my usual 70. Fee’s technique in brief: short intense anaerobic training; variety of training; good diet; stretching. I try. Off to the gym. 4 http://petemagill.blogspot.com, if you can get it to load, has entries from Earl Fee, Younger Legs for Older Runners. 5 You might also look at Ed Mayhew, http://www.YouCanGrowYounger.com and http://www.FitterForLife.com. 6 coincide; to destroy a metallic monetary unit. I note here that while I was markedly good at running in my late fifties, so are many others still running at that age. Just last weekend in a parkrun the 1st finisher—both absolutely and in the 55-59 category – did 16:18, an amazing 97% on the age-grading tables. Chris McDougall may have the last laugh, too (in saying 18 equates to 62), since during my 62nd year I broke down (see The g in running, essay 188) and I have struggled since then to perform at better than 75%, where 80% plus was deliverable if races were far enough apart.